I think the picture really says it all for this SoundSet. It sounds like that... and not in a good way! Vats of bubbling goo, boiling liquids and the sounds of tools going places in humans that tools were never meant to go. 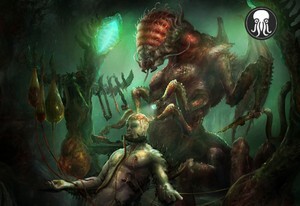 The "Mi-Go Laboratory" is a place of true Cthulhu-esque horror! And every unsettling blop and sizzle is yours in this colorful evocative SoundSet.